The recent disgusting and shameful yet shameless brawl that engulfed what was intended as a friendly match between two allies (Gilas Pilipinas and the Australian team) brings us to a point of deep reflection as a nation of civilized Homo sapiens. The grave level of pikon (butthurt) and crushing tambak defeat of the “Pinoy” shooters would not have been so depressing had the entire ballgame been a fair match to begin with. The basic question is: Why did Filipinos being genetic underdogs even choose basketball to be their de facto national sport anyway? I remember back in my younger years when there were still baseball leagues for kids in our community: complete with pro-looking uniforms, caps, gloves, bats and all. Somehow after Cory’s ascent to power, Filipinos dropped everything else to focus on just basketball, as well as showbiz and politics (notice how personalities in these arenas simply hop around among these 3 bins – take Joey Marquez for instance). Why would obviously genetically disadvantaged Filipinos bother to participate in a field of competition where height is might? Why seek to gain international respect in a competitive arena where Filipinos are by default clear losers? If there’s no way Filipinos will ever be able to have a dream face-off with even the least of NBA teams to gain international respect in basketball, why even bother? If there was a race between an American eagle and a Maya bird, who would you bet on? However, no-brainer questions such as these are things that even have to be debated over in the land of the scorching sun. For one, it’s got to be the weather, as always, that’s to be blamed. Our relentlessly over-zealous sun and the humidity that makes you perspire as if you had a shower – these conditions make it difficult for outdoor sports like soccer, American football, or baseball to gain widespread popularity. Besides, these sports can require significant capital and equipment (large tracts of land, or expensive sporting gear), making them not really cut for a pro-poor society such as ours. But the biggest factor is really the sun: basketball can be played in gyms or beneath the comforting shade of trees and buildings all over the country. All you need is a piece of the road and an elevated hoop. Uniforms? Why bother – just make one team remove their sandos. If Filipinos really were serious about basketball, they would intentionally breed Filipinos custom-built for the purpose. But then we leave everything to chance – when once in a while, a Filipina happens to fall for a tall or black foreigner. People are so afraid of eugenics because images of Nazi’s Third Reich (Hitler’s mustache) or evolution-inspired elimination of the weak or Japan’s forced sterilization; but we can adopt a human-rights-friendly approach; for example, give tax incentives to couples that produce genetically superior citizens and athletes. The easier way is to simply swallow our pride and accept the fact that Filipinos are short. One thing the brawl proved was that Filipinos are natural boxers. Did you see those smaller Gilas cagers flying through the air reaching out to slam the head of a towering Australian? Look at the Thais – they are respected in the kickboxing arena. Boxing (beating up each other) is an area that holds promise to the ASEAN physical built. So maybe we should take the cue from Manny Pacquiao, our living legend. The good thing about boxing is that there are weight divisions. So there’s no way a muscular Mike Tyson will be pitted against a leaner Manny Pacquiao. Gilas vs. Australia was a total freak’n mismatch gone haywire from the get go. Even with the imports, Filipinos were relegated to being just supporting actors. And there’s no real national pride in that. Filipinos have historically excelled in indoor sports; again anything that has to do with escaping those scorching UV rays of the sun: for bowling we have Paeng Nepomuceno and for billiards we have Efren “Bata” Reyes. One indoor sport we should take seriously is table tennis (ping pong). It was a favorite among boys I hung out with in my high school days. It can even be played as a small team: doubles. But then it may be too difficult to part ways with a team-based highly interactive action-packed sport such as basketball, a sport for which every local barangay or school has infrastructure and space allotted for so that young Filipinos can be kept from getting drawn into drugs and vices. Well in that case, we should be happy for the time being to probably just limit Pinoy international competition to the ASEAN games. OR… as we have major and minor leagues or weight divisions in other sports, there could be a similar scheme for basketball as well. We simply cannot go on dreaming to become champions against genetically superior and agile Blacks or towering Caucasians. FIBA should review the rules to truly promote friendly and fair competitions. Eventually, there should be basketball for “small people” in the Olympic Games, just as males and females compete separately, and as there are Paralympics for the handicapped. Better yet, there should be a basketball division for “small people” with pikon issues. This way, a basketball match can legally turn into a boxing brawl (switching back and forth between 2 modes) in a way that can be double entertaining. Let’s see how things go for the country’s sports and athletics where just like its typhoons … anything goes! Because of all the latest GRP articles regarding the PH & AUS match, I was wondering how the Netherlands was ranked. Well, the Netherlands are ranked 44th on the Fiba ranking. The Philippines are ranked 30th. Australia is ranked 10th. Now, why are the Philippines ranked higher despite the Dutch being taller (in general on average)? First and foremost – I think – because basketball is less popular in the Netherlands and there are less fish in the ocean compared to the Philippine ‘ocean’. Well, my country, the Philippines have so many reasons why basketball is very popular in here like it is an indoor sports & my country under a tropical zones unlike in your country, the Netherlands is a sub-tropical nation thus soccer/football is very popular there. Another reason is history since my country was under an American colonial rule right after the Spanish-American War in 1898 & they’d introduced baseball & basketball when they came in here more than a century ago (but they forgot to introduce their national sports called American football which is quite similar to Rugby) but the popularity of basketball in here came to a limelight right after the Second World War when the Philippine Men’s Basketball Team had won a gold medal in the 1st Asiad Games for the 1st time in 1951 & the rest is history. We cannot play outdoor games like soccer, American football, baseball, cricket, etc. due to the tropical climate in here which is NOT very comfortable especially at the height of so called “Climate Change” unless if my country is within a sub-tropical zones like in Japan & China then outdoor sports will be popular in the Philippines instead of basketball. And if you wonder, why we the Filipinos have this very aggressive manner & we have a PIKON attitude just like what it happened when Gilas Pilipinas made a huge brawl against the Australian basketball team last July 2, 2018 is again, blame the uncomfortable tropical weather in here. And another one is due to the lack of PROPER EDUCATION in which the Gilas Pilipinas players should learn it on how to show respect & humility to their opponents & use discipline when they play basketball. So this is an awful truth why Gilas Pilipinas shows their unsportsmanship character & bad cultures to their team when they’d fought against the Aussie basketball team on that night. This is a wake up call to the Filipinos right now & if we couldn’t correct these kinds of mistakes, then it’ll marked our legacy to the whole world forever. ???? What do you mean about “outdooor” games like soccer not being popular here? And why bring the weather to that equation? If so, why does soccer thrive in most tropical/sub-tropical countries like Mexico, Brazil and Senegal? Well, Peter, that is the comments/opinions we get from people who are not knowledgeable of the subject(soccer). @Peter that’s because the countries that you’d mentioned it are NOT part of an American colonies in the early 20th Century unlike in the Philippines, Guam & Puerto Rico. Their former colonial masters was the British, French, Spanish & Portuguese and those countries introduced football/soccer & it was a favorite sports for the Europeans since then and they’d spread that sports outside Europe on the height of Age of Discovery & Colonization from the 16th up to the 19th Centuries. Which is now football is the most favorite sports in the world & the reason of it is because as what I told you before: HISTORY. One of my former Dutch co-workers (who was 1.93 m) said he didn’t like basketball. I asked why. He said it was for tall people. There’s enough irony there to mass produce weapons for another Battle in Marawi. I myself am 6’3″ (or +/- 1.90m) and I never considered playing basketball (as a hobby or even professionally). Why? No talent whatsoever. Plus, with my height I think I am still a shorty for playing basketball. You’re tall enough to be a point or a shooting guard as per NBA standards. All you need is skill. Then again, you’re also tall enough to be a defender/goalie in football or possibly develop a powerful serve in tennis or pack a strong punch to be a heavyweight boxer. the Dutch are the tallest people in the world. Filipinos on the other hand rank #3 from the bottom of the list of 98 countries. your article is focusing on the negative aspect of our height, and taking it all against our favorite hobby. while it is true that height is might in basketball, the general rule of devising a play that is almost always close to the basket has now been revealed as NOT THE ONLY OPTION. in the NBA, the three point shots are now being accepted as part of the ISOLATION, and even during fastbreaks. as this is now an accepted norm of offense in the NBA, quickness and shooting accuracy from beyond the three point area will diminish the height factor. your contention will then be obsolete. since we don’t even need to breed the special kinds. our streets are filled to the brim of real fanatics. Isolation play in the NBA is now frowned upon because of its inherent ball stopping result and allowing opponents to set up their defenses. That is why Carmelo Anthony is no longer the first option. Teams that still adapt the isolation/one on one occupies the bottom rankings in the last nba season. I’ve been told that Gilas is relying too much on isolation play and dribbling, making them too predictable. Then they rely mostly on the big names, such as Blatche, Romeo and Castro for offense, then Blatche, Fajardo and Aguilar for defense. Probably not everyone can shoot well, so players’ roles are limited, but it’s better if everyone can do decent shooting and maybe even defense too. So the genetic disadvantage of height is compounded by wrong decisions. So this not from a sports writers, but a sports fan who watches a lot of basketball and probably knows his stuff. I disagree that Filipinos are “genetic underdogs”. They’ve probably bred into themselves some dysfunctional characteristics, but those characteristics would be easily bred out again … if the social conditions were right, which they probably never will be. However, it’s certainly pretty stupid to make basketball your national sport when the genetic potential for producing extraordinarily tall people is very low. This strikes me more as the Filipino propensity for self-punishment – making life far harder than it needs to be by doing illogical things – than a genetic problem. I do not understand this whole idea of genetic disadvantage . That is another way of playing victim card. Pinoys are adverse to intellect and discipline. The Japanese are not. So let’s take the Summer Olympics from 2016. The Olympic gods smile on the Philippines even once in a while. A silver medal!! As in singular. Japan has 7 more than us. Silver medals I mean. They came up with a total 41 medals in Brazil. The Philippines got one. They have a slight advantage in terms of population. They are no different than we are genetically. Then how can we be so proud of one silver medal in 20 years and they have forty more in a single Olympics? We treat Hidilyn Diaz like she walked on the moon… barefoot. My posts say so much my critics are disturbed by their mere presence and don’t bother reading them. I have been using the same ID for six years. While you are using a burner account. So even if you are habitual you are the one without the guts to stick to the same ID and just get off stalking me and my habits. Critique the content. Guess taunting without content or even the accountability of a steady ID is your thing. I doubt you have anything of your own to link to. The ONLY sport that we should win in the Olympic games is stealing the taxpayer’s money as what it do to our politicians for many years but unfortunately it isn’t included in the Olympics. ???? Would love to be proven wrong on the Pinoy’s genetic disadvantage in the world of basketball. Filipinos can probably make up for the height difference by 3pt-range accuracy and jumping ability, and pull off a David vs. Goliath win over the US team in the Olympics someday. But if that “someday” never comes within the next 3 Olympic games, I would highly recommend going full throttle with the naturalization of African Americans. Yeah, just let them all come pouring in. Height doesn’t matter? Let’s see if this Pinoy-taunting article will actually turn in positive results. Basketball is not just about height. 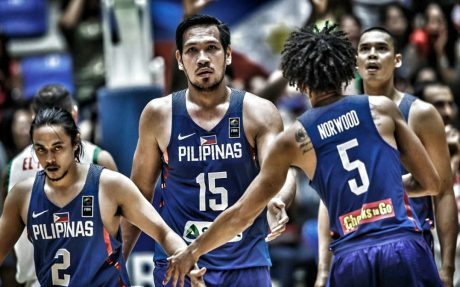 The Filipino players need to improve overall playing skills, team work, discipline and coaching to even have a considerable chance against the top teams of the international basketball world. But I do concede that height provides a verifiable advantage. Sports afterall is not just about talent. Filipinos starting to have issues with agility when they reach 6’5″ and above. Also Filipinos lacks 3 pt. shooting accuracy, we have better 3 pointers back in 80s and 90s. At the turn of the millenium, 3 pt shooting seems like a taboo for an average filipino baller. Then Filipinos need to adapt. Still, height is very useful an advantage to have. Speed and agility can be honed through training. They sure don’t shoot the way they did because they feel cuter having a dribbling exhibition before passing or shooting the ball. I originally intended to make this a blog post, but I’ll just make it a comment, and shorter. Perhaps others are right that the brawl was inevitable in the heat of the moment. It was actually fast, didn’t last for minutes. I agree the Australians started it. But that briefness reminded me of Malcolm Gladwell’s Blink. He says, many major decisions are made in the blink of a moment, and any training, upbringing or preparedness comes into play. One case that was studied was the shooting of Amadou Dialou, a Guinean immigrant to the U.S. in 1999. Plainclothes police were checking him out, likely on a profiling reaction, then Dialou in fear ran back to his house. He stopped short of the door, thought of taking out his wallet to show ID, but the police thought it was a gun and shot at him 41 times. Killed, of course. This is one of many mistake shootings in the U.S., but the key Gladwell focused on was that the officers failed their “blink” moment. If they were better able to judge within that blink moment, they could have avoided killed Dialou. So could the Gilas team have failed their “blink” moment? Could they have avoided a similar mistake with better training or similar? Perhaps Gilas players (and coaches) might benefit from training specifically for that kind of scenario to avoid a similar incident and perhaps at least minimize the suspensions. The jury is out on that, yes, and we wouldn’t know until a similar incident happens again. Which would be far, since the suspensions of the team may last long. I’ll say we never said Gilas started it. It was just a messed-up way of reacting to the bullying. Yes, sometimes our defining moments are made in a few fleeting seconds. Agree with a “rules of engagement” training for various possible/unexpected scenarios. Knowledge of the repercussions of less common violations should also be clearly spelled out for all players/coaches. The problem with Filipinos is their propensity to take matters into their own hands without giving things much thought rather than letting authorities (in this case – the referees) handle it. In general, Filipinos are not just genetically short in stature, but also very short on patience (this is magnified much more when they feel hopeless, “tambak sa ballgame”). And I wonder if there’ll be an alien invasion in our planet & those aliens would like to play basketball. The first team to face with them is none other than Gilas Pilipinas and I wonder if they’ll gonna win the “basketbrawl” match against Gilas. Will it be the same situation as what Gilas had done to the Australian Boomers last July 2, 2018? ???? Monstars vs. Gilas Pilipinas (Micheal Jordan not included) ???? I kinda like that smaller height division. like 6’0 limit and 5’6″. It has been tried before. https://en.wikipedia.org/wiki/World_Basketball_League Of course there are some people who posted before you who will judge links as shameless. From the same obedience school that says GRP should not write about sports. Funny how that worked out. Thanks for the link Gogs. I hope the Gilas vs. Australia basketbrawl will trigger the revisiting of such a basketball division, to the point of having it adopted in the Olympics soon. The Pinoy team’s being “super tambak” (overwhelmingly outscored) really added to the heat and intensity of the free-for-all punching, kicking and chair-throwing spree. The story would have been very different had it been the other way around, in terms of score. A fair game should begin with fair playing parameters: in this case player height. I would go for 6 feet max for all players in this lower-height division, except for one player acting as center – who can be up to 6’5″ (or even no limit). Filipinos can easily get a gold medal in the Olympics with this kind of setup. Another league, more viewers, more ads, more business – does anyone have anything to lose? Speaking of Joey Marquez eh magaling siyang shooter aand KriSTD can attest to that. How little we really know about the life all around us. Would we be so cavalier and ruthless with it if we understood it better? It is not the Sports that is the issue here. It is about accepting defeat. Games are like that; there are winners and there are losers. Sometimes you lose, sometimes you win. It is how you handle defeat in a game that matters. You don’t go on beating the other guys in the other team, because you lose on the game. In most cases, kids will take on that sport their parents did (and or even still do) or kids will take on that sports that the kids in the same street play. Sports in my country are club-oriented (and not school oriented, like in USA). We can start almost any sport from the age of 6. Boxing never had and still doesnt have my interest. I dont see the fun in beating up somebody. I actually played football (soccer), tennis and field hockey. Its a perfect mix of a single sport (tennis) and a team sport (football and field hockey). In a single sport (tennis) you cant blame a teammate for a lost match. I can only blame myself. And that was and is an eye opener (for myself). Even when I am a prolific goal scorer in football, I cant do it without my teammates. Hence, again, a perfect match and mix to do a single and team sport. I once stood in goal at a football match. It wasnt a success. I ended up in hospital with a concussion. The attacker of the opposite team, hit my head with his knee. Not me. If I ever plan on having children, I will give them a football as soon as they can walk. If they grow to at least 1.8 meters tall, then perhaps tennis. Basketball will only be considered if they are above 1.9 meters tall. Sometimes you have to break tradition in order to get things moving. Most sports clubs organize “open days” where kids can play that sport and see if they like it. I think that is a good thing. It gives kids a chance to find out which sport they like and maybe have some talent in/for. We all dont need to become that top player (the Messi’s, the Federers etc) as long as we enjoy the sport we do. The most annoying thing is when parents PUSH their kids to do sport X, Y or Z and train/practise 4 hours per day, each day. Kids also have to be kids. I am all in favour to break traditions. I always thought the Swedes or the Danes were taller than the Dutch. It (being tall) has its benefits and also its disadvantages. I am still not sure why PH people always look at me (and even turn their faces/heads when they already passed me). Is it because I am so tall (compared to them) or is it because I am ‘white’? Well I guess both, or it could even mean “this guy likely has MONEY!” Low-altitude-gliding Pinoys would most likely be “looking up” to people like you in every sense of the word. Looking at somebody for more than 3 seconds is frowned upon in most decent societies. If anybody happens to be struggling in this area, I’d recommend wearing sunglasses just to keep the peace. Looking at you for more than 3 seconds is not frowned upon as long as I know you (and you know me). Okay, it still looks a bit odd and strange but its not frowned upon. When we both don’t know each other, one must be carefull. However staring at a beautiful woman, you will still see today (and vice-versa). When you and I are talking with each other (face-to-face), wearing sunglasses is considered to be impolite (a bit against the etiquette). We want to see the eyes of the person when we are talking with her/him/them (or does that sound ‘soft’?). By looking at me, its rather impossible to see whether I have money. A better clue can be found in my bank account. (Serious now =>>>) the fact that I can travel to a foreign country doesnt say anything about my wealth. Travelling abroad is not that expensive. It doesn’t matter on how tall, short, fatty or thin the Filipinos are. The MOST important thing for us is to REFORM (take note of that word & it’s better than using the word “Change”) the cultures & attitudes of the Filipino people like they should be discipline themselves, Filipinos should NOT become a sore loser (aka Pikon), eliminate favoritism, jealousy (inggitan or envy) & false pride, using “diskarte” in our lives in a SERIOUS ways, etc. Better yet if we, the Filipinos should convert us to become either a Singaporean [http://www.traveletiquette.co.uk/etiquettesingapore.html] or a Japanese [https://www.lonelyplanet.com/japan/travel-tips-and-articles/japan-dos-and-donts-etiquette-tips-for-first-time-travellers/40625c8c-8a11-5710-a052-1479d277bb35] (as to contrast what Gilas Pilipinas player, Terrence Romeo that we should convert it into an Australian citizen). And why we should convert either to become a Singaporean and/or Japanese rather than an Aussie or any race/nationality? That’s because their cultures, attitudes & traditions are WORLD CLASS & very utopian that you could say it’s “perfect” & this should have been in our world if we could really adopt them & we could reflect on it what we had done wrong if those kinds of etiquette, cultures, attitudes & traditions should exist on our lives & our human nature should had been better. If we could adopt that & apply it to our daily lives like works, politics, education, sports, communications, etc. then Filipinos will be a WORLD CLASS citizen & not a monkey/barbaric-like citizen! ???? you sound like a politician. All peachy and swell. But pls also add how you think (or how you will accomplish all this) you can achieve your goals to ‘reform’ 100+ million people and in what time frame and at what cost (yes, in real money). Then also have a plan B in case your plan A will not work (will not come to fruition). If you provide all the above, you may get my vote (subject to being realistic). Otherwise, pls go back to the drawingboard.